Ohio Means Success is where to start looking for Ohio colleges. This is a general information website on planning, searching, and paying for college in Ohio. The site consists mostly of links to other websites. The focus is on state institutions although it does have a page with links to independent colleges and universities. There is no search function to locate Ohio colleges. The website includes a brief overview of applying to college and a limited list of steps to take at each grade in high school. The more useful elements of the website are the Ohio Transfer to Degree Guarantee section which helps users identify which credits will transfer. However, it only applies to public institutions. The Pay for College section has a list of grants and scholarships specific to Ohio including the Forever Buckeyes program which removes the residency requirements for students who left the state after graduating from a Ohio high school. The Low Costs Pathways lists programs that allow students to start their degree at community colleges and finish at a four-year institution. Users will also find a tuition reciprocity summary that list agreements with Indiana, Kentucky, Michigan, and West Virginia. The Ohio Association of Student Financial Aid Administrators website is worth a visit. The Students & Parents section includes a link to Ohio’s College Goal Sunday for help in filling out the financial aid form. They also provide a downloadable Cost Comparison Worksheet as well as links to information on scholarship scams. There are 80 four-year Ohio colleges with 500 or more full-time undergraduates. 47 are private not-for profit colleges and 33 public universities according to the Integrated Post-secondary Data System. Of the 299,996 students, 30% attend private Ohio colleges and 70% attend public universities. 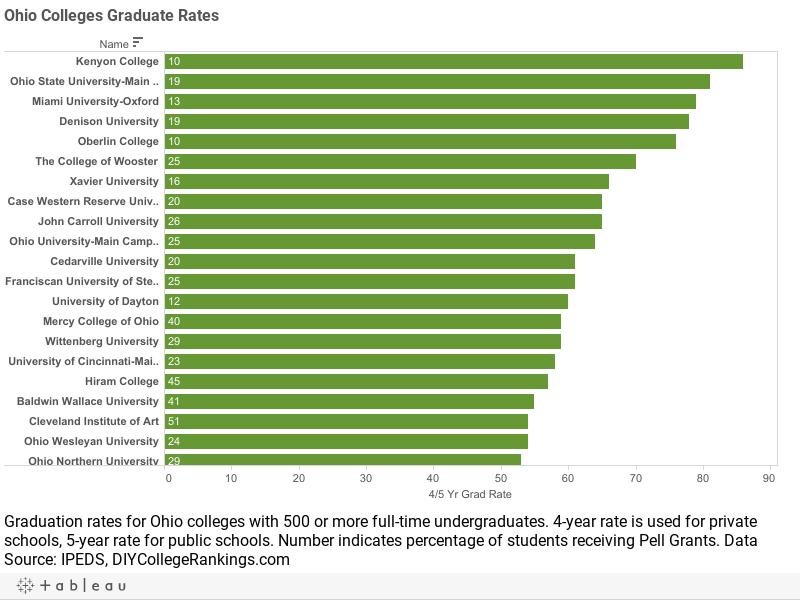 The average four-year graduation rate for private Ohio colleges was 43.6% and the average five-year rate for public schools was 32.5%. 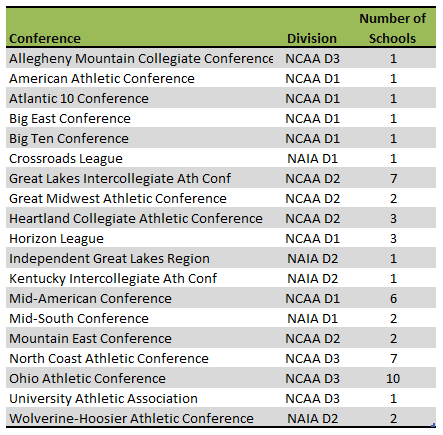 A total of 25 Ohio colleges meet the DIY College Rankings 50-50 profile requirements. College-bound seniors in Ohio had an average of 22.0 ACT Composite score with a 21.4 for English and 21.7 for Math. The 75th Percentile scores were a Composite of 25, 25 for English, and 25 for Math. A total of 35 colleges’ ACT 75th% Composite scores were at or above this level.